Thank you very much for registering to take a course with us. We look forward to sharing a Wilderness Medicine learning experience with you! The classes will run from 8am to 5pm every day. We will take a lunch break, usually from Noon to 1pm. This year we will be at Taos Tennis at Quail Ridge Taos, which is a little under a mile North on 150 (the road up to the ski valley) from the 64 and 150 junction Quite obvious on the left side of the road. The classroom entrance is at the back of the building. 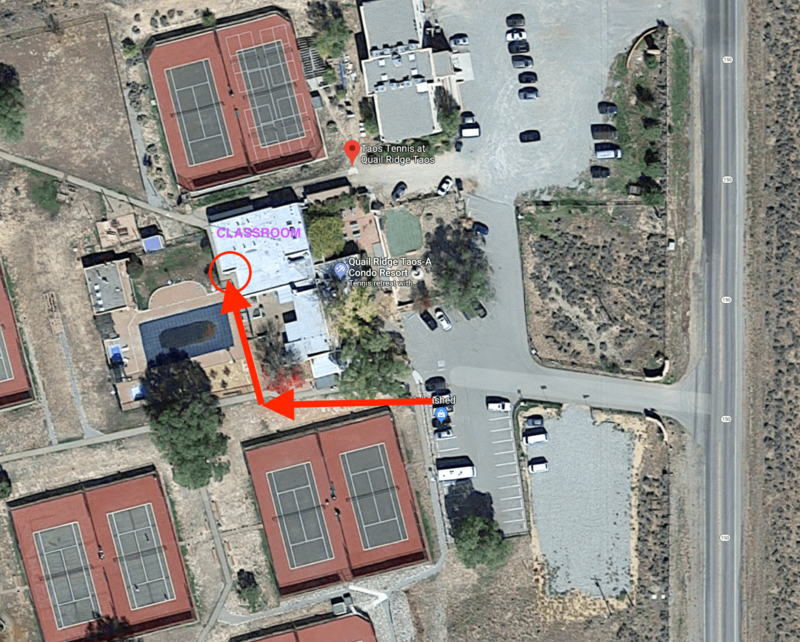 From the parking lot, go down the sidewalk between the building & the tennis courts. At the end of the building turn right & walk between the swimming pool & the building. Stay left along the swimming pool fence. Our classroom entrance is the FAR LEFT DOOR facing south, set back from the rest of the building. If you have a balance due (you opted to pay “Cash”, “Check at Course”, “Deposit”, or “Custom”), please bring final payment as Cash or Check (we will be unable to process credit cards at the site). Recertification Students: Your course days are Tuesday April 16th through Thursday April 18th. In addition to the completed Course Study Guide you were sent, Please bring your current certification cards etc. with you. We have to confirm your certification dates, program etc. in our documentation paperwork. Please also bring any course materials you may have (WARM or other textbook, Lecture Notes, Scenario Book, Field Guide). Don’t worry, you’ll get a new WMA field guide with this course. Clothing appropriate to the weather. We will be outdoors as much as possible within the curriculum and will train snow or sunshine. We recommend a wind/waterproof jacket of some kind. The classroom can be a little chilly in the morning so you may want to bring fleece/wool/warmies/etc. Sturdy walking shoes/boots. There will likely still be snow, and the scenarios and simulations may be outside. You may be required to transport patients through a variety of terrain. This year we are closer to town, and there are some close by food options (including a supermarket). We will have hot water, coffee, and teas available.